The hostel Dvor awaits you with 13 comfortable and modern rooms. The hostel has a kitchenette, breakfast is not provided. In the common room there are apparatus for coffee and tea as well as a common refrigerator. Kitchenette also includes dishes and cutlery for guests to use. 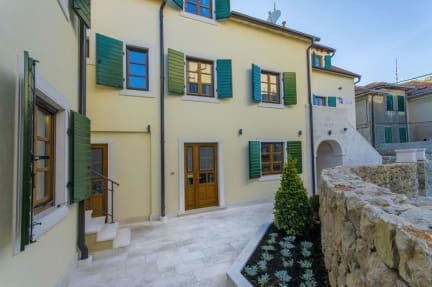 We are located in Varoš, which is the oldest and most famous part of Split, with numerous small streets easy to get into city center or the Marjan, hill above. Nearby you can find small shops, a post office, pharmacy, caffes, ATMs. Historic stone houses and streets are the trademarks of the Varoš and history of Split. Easily accessible city center or nearby park-forest Marjan, for recreation and swimming, give us the best position for visitors around the world. For maximum comfort, all rooms are equipped with air conditioning. Do not worry about luggage, because in each room there is a large locking closet for storage. For leisure and relaxation in the moments of rest you will find a satellite TV and free Wi-Fi. Each room is equipped with air conditioning. Most rooms have bunk beds except double rooms and rooms in the attic. All rooms have electronic card keys. Of course, clean sheets and towels imply as standard for all our guests. Payment upon arrival by cash, credit cards. This property may pre-authorise your card before arrival. Taxes not included - city tax 7.00 HRK per person per night, 12-18 years old 3.50 HRK per person per night. Reception: 08:00-24:00h in person, other by phone or email, sms. Lovely hostel in great location. Fantastic hostel, well located really clean. Would recommend to everyone. Too class dorms and bathrooms. Amazing hostel accommodation, modern and spotless. Easy walk to old town and waterfront. Highly recommend! Roughly a 20 minute walk from the airport bus station, a little out of the city centre. Very charming, clean rooms and bathrooms, breakfast is complimentary, staff are very helpful. A beautiful hostel! The staff were lovely and helpful. The hostel is nice and close to town and the free breakfast is perfect. Would definitely recommend staying here! Great location and large rooms and bathrooms that are very well equipped. Super comfy beds with AC and each bed gets a large closet to secure your things. Breakfast is included but a bit mediocre. Staffs are a bit more serious here but very professional. Not much of a social atmosphere but great for catching up with your sleep. 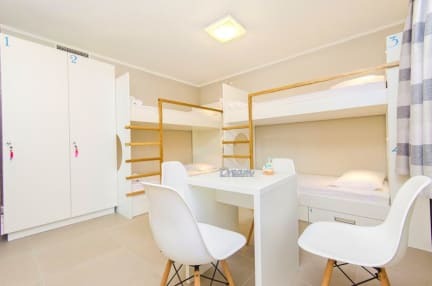 A very modern and clean hostel. The complimentary continental breakfast is a really nice added bonus. AC and Wi-Fi work really well. The staff are very friendly and they let me check in 3 hours earlier and allowed me to store my large bag for 2 nights when I went to Hvar for no additional fee. Thank you for the great stay! Very clean rooms and outside spaces . Great location with lots of bars , shops nearby,10 min walk to the Riva promenade. This hostel was super clean, felt more like a hotel and was a perfect location! Only downside is that the staff were not very friendly or outgoing, they just gave me the key and that was it. It would be nice if the staff were more friendly and told you about things to do in the city and just make conversation with you, but they only do this when you ask them something specifically.